NACOGDOCHES, Texas - The Stephen F. Austin State University School of Theatre continues to present "Three One-Act Plays by Asian Authors" at 7:30 p.m. nightly through Saturday, March 2, in W.M. Turner Auditorium on the SFA campus. 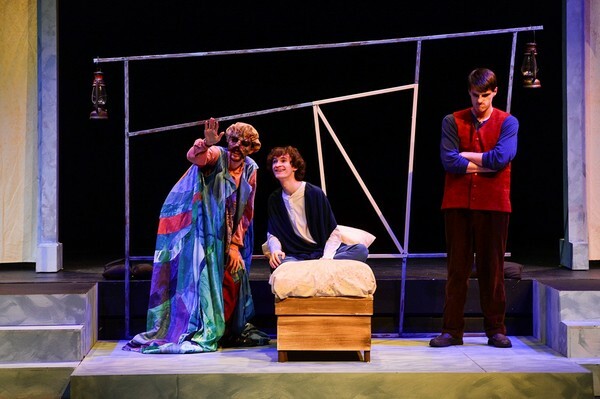 Among the student performers in Rabindranath Tagore's "The Post Office" are, from left, Gilmer senior Hunter Ballard, Leander sophomore Zach Loveday and Tyler junior Holden Guinn. Other one-act plays include Mishima Yukio's "The Lady Aoi" and Gao Xingjian's "Hiding from the Rain." Single tickets are $15 for adults, $10 for seniors and $7.50 for youth. Tickets for SFA students are $5. For tickets or more information, call the SFA Fine Arts Box Office at (936) 468-6407 or visit http://www.theatre.sfasu.edu/.